We have examined a laser ultrasonic technique for the visualization of ultrasonic waves propagating on a solid surface. Scanning an optical heterodyne probe to measure surface transient displacements, ultrasonic waves in the frequency range up to 50MHz are detected and passed to a personal computer through a digital oscilloscope. The recorded signals are reconstructed to make three dimensional displacement images at any propagation time. By use of this imaging system, we observed the scattering and diffraction of ultrasonic waves around various shapes of artificial defects, and examined the application to nondestructive inspection. Techniques for visualizing wave propagation can be very useful with regard to both the educational and research aspect of studying various wave propagation phenomena. The photoelastic technique and the Schlieren technique have been used for the visualization of ultrasonic waves. However, these techniques are applicable only to transparent media. More recently, using an optical heterodyne interferometer, we have developed a digital ultrasonic imaging system for visualizing and analyzing ultrasonic waves propagating on opaque solid media. This visualization method can produce a series of successive images as an animation of wave propagation. Using this method, we observed the propagation of ultrasonic waves around various shapes of artificial defects such as fatigue cracks, notches and penetration holes. We also examined the scattering and diffraction for these defects and have been confident that this technique is available for nondestructive inspection and materials characterization. A new developed ultrasonic imaging system is shown in Fig. 1. An ultrasonic probe is mounted on a specimen for emitting repeated ultrasonic pulses. The ultrasonic displacements on the surface of the specimen are detected by scanning a laser optical probe (optical heterodyne interferometer) with a minimum pitch of 1mm. The detected displacements are stored in a computer hard disk. After the measurement, the stored data are reconstructed as animation images of ultrasonic wave propagations. By use of this imaging system, we can measure nano-meter order displacements in the frequency range up to 50MHz. In our visualization system, ultrasonic waves at all scanning points are stored as digital data, so that we can offer a variety of visualization images as give below. The measurements for these images were conducted using an aluminum plate having a cylindrical penetration, as shown in Fig.2. This image shows the displacement map of the ultrasonic waves at any propagation times. Figure 3 shows the propagation images around a cylindrical hole at a propagation time interval of 1ms, from which we can easily understand the scattering and diffraction of the ultrasonic wave propagating around a cylindrical defect. We can offer the animation images on a computer display as well. 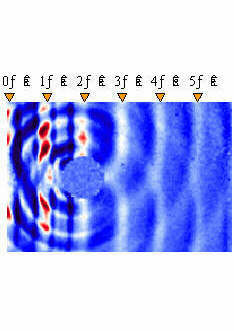 Amplitude image shows the maximum amplitude map of the gated wave, which corresponds to C scan image in ultrasonic inspection. 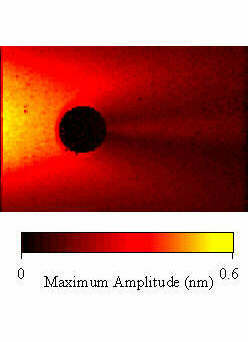 Figure 4 shows the amplitude image around a cylindrical hole. From this figure, we can observe the intensity distribution of the diffracted waves behind the hole. Arrival time image shows the arrival time map of the wave front. Figure 5 shows the arrival time images around cylindrical holes with different diameters. Trajectory image shows the overlapped propagation images measured at a given time interval. Figure 6 shows the trajectory image around a cylindrical hole measured at a time interval of 0.8ms. Velocity image corresponds to B scan image in ultrasonic inspection. For example, the waveforms on the line A in Fig.7 are shown in the left figure. When these waveforms are drawn as B scan image, we can obtain the velocity image around a cylindrical hole as shown in Fig.8. The gradients of the inclined lines in Fig.8 represent the sound velocities. The sharp slope means the low velocity. Thus, we can easily estimate the sound velocity. In this section, we introduce a few applications of the visualization technique for inspecting and characterizing materials. 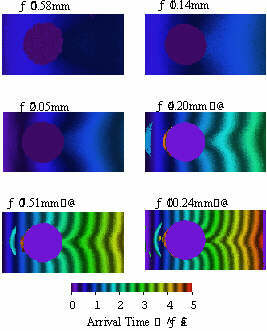 Figure 9 shows the propagation images of the ultrasonic waves propagating around both slit and fatigue crack. The depths of these defects are about 10mm, and the width of the slit is 0.3mm. An angle beam transducer was used for emitting ultrasonic waves as shown in the top figure in Fig.9. The nominal frequency of the transducer was 5MHz. The wave propagations around these defects are different with each other. In the case of slit, the ultrasonic wave cannot transmit the slit but creep around the slit. From this image, we found that three types of waves were propagating around the slit as shown in the top figure in Fig.10. As shown in Fig.10, the third wave that creeps around slit surface has a linear relationship between its propagation delay time and slit depth. Hence, we can estimate slit depth by measuring the delay time of the third wave. On the other hand, in the case of the fatigue crack, we could not observe the wave creeping around the crack but the wave transmitting across the crack. As can be seen in Fig.9, the transmition of the ultrasonic wave through fatigue crack causes a slight propagation delay. The relationship between the propagation delay and the crack depth is shown in Fig.11. By use of this linear relationship, we can easily make an approximate estimation of fatigue crack depth. where, jzr and jsus are volume fractions of both ZrO2 and SUS410, respectively. V represents the surface velocity. is reduction ratio of creeping wave speed.b is pore shape factor. Hence, we can estimate the porosities from equation (1), using the values of Vzr = 3220m/s, Vsus = 3050m/s, a=0.8 and b=2. The estimated values were shown in Fig.13 compared with the measured values, which means we can estimate porosity distribution in FGM by use of the ultrasonic visualization method. Noncontact ultrasonic imaging system was developed for the visualization of ultrasonic waves propagating on opaque media. This imaging system provides propagation image, amplitude image, arrival time image, trajectory image and velocity image. By use of this visualization method can produce a series of successive images as an animation of wave propagation. This technique is applicable to nondestructive inspection and materials characterization. 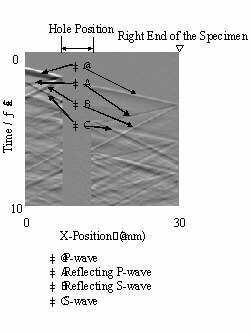 Takatsubo J., Imade M., Fan Q. and Yamamoto S., Visualization of elastic waves by digital laser ultrasonics (in Japanese), Vol.65 No.639, 1999, pp4299-4304. J. Takatsubo and S. Yamamoto, Propagation mechanism of ultrasonic waves in porous ceramics, JSME Int. J., Vol.39, No.2, 1996, 266-71. Q. Fan, J. Takatsubo and S. Yamamoto, Quantitative characterization of advanced porous ceramics based on a probabilistic theory of ultrasonic wave propagation, J. Appl. Phys., Vol.86, No.7, 1999, 4023-28.